In the early 1970s, my husband and I volunteered with Mid-Peninsula Citizens for Fair Housing. Here’s an article about the organization I wrote for my Christchurch, New Zealand paper. Discrimination in housing on the basis of race, color, religion or national origin has been illegal in the United States since 1968. But it is not so easy to legislate away prejudices so deeply ingrained that they are written into the textbooks of realtors and enshrined in the housing patterns of all our communities. One group that has found this out the hard way is a San Francisco Peninsula organization called Mid-Peninsula Citizens for Fair Housing. Committed to the right of all persons to purchase or rent property wherever they choose, MCFH evolved in 1965 out of a nucleus of citizens who had fought an election proposition that would write in to the California constitution the right of the housing industry to perpetuate the existing discriminatory housing patterns. The proposition passed, and MCFH learned its first lesson, that even in this allegedly liberal area, the housing market was tight shut. Education, they concluded, was the key. By the time the federal Civil Rights Act of 1968 outlawed all measures like Proposition 14, MCFH had speakers visiting schools, factories and church meetings. Representatives started talking with local government officials and housing developers, focusing attention on the problems of housing for the aged, and other low income groups, as well as on racial minorities. A full-time lobbyist was employed to keep in touch with elected representatives in Sacramento, the state capital. 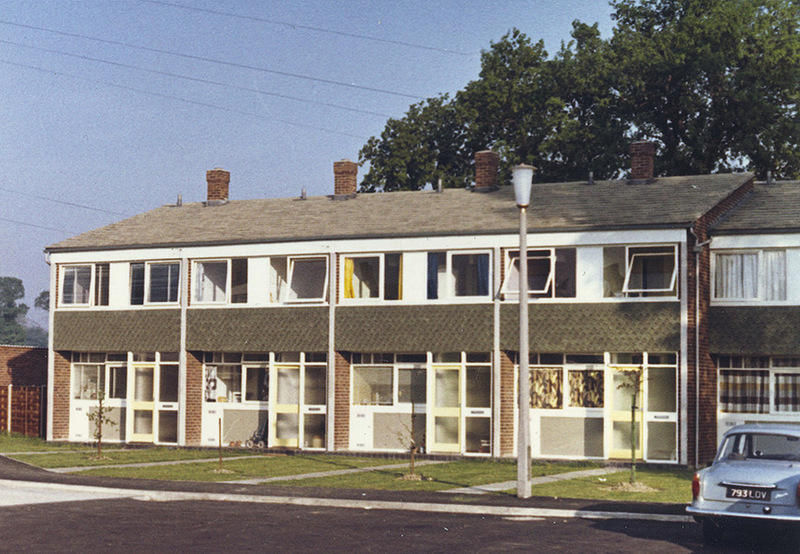 With the legal clout of the 1968 Act, they set up a legal aid service for members of minority groups discriminated against in obtaining housing. When a complaint is received, the Fair Housing Office sends out a White volunteer checker. In order to eliminate other legitimate grounds for a landlord to refuse an apartment, the checker matches the complainant as closely as possible, in everything except race. The availability of the home, and the terms offered, are compared. If discrimination is apparent, MCFH offers the services of a volunteer lawyer, or assistance in filing a complaint with HUD. But still this was not enough. Blacks and Chicanos, seeing the organization as yet another example of white liberal condescension, have been reluctant to contact the Fair Housing Office. 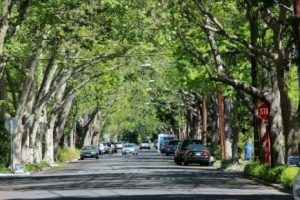 On current showing it is affecting only one percent of the apartments in the area each year, and even fewer of the real estate sales. Meanwhile Peninsula communities are becoming more and more segregated, in terms of race, age, and economic status. Now MCFH has added a new weapon to its arsenal. It is the community audit, a technique designed by Howard Lewis, a local realtor and vice-president of MCFH. The method used for an audit is much the same as that used to check individual complaints. The difference is that it is done by people already living in the neighborhood, who see their effort as a contribution to the community as a whole, and not to their individual housing needs. Teams of checkers are made up: one White, one of a minority race. Most of the audits so far have been White/Black, but some White/Chicano audits are getting under way. One after the other the team members apply to their assigned apartments, and report back on the terms offered to them. The results are frequently double-checked, cautious MCFH lawyers preferring to give apartment managers the benefit of the doubt in dubious cases. But eventually a profile of the city’s housing practices emerges: in so many cases the Black was told that nothing was available, but the White was invited right in; in so many cases the rent quoted to the Black was higher, or the cleaning deposit was larger, or the credit check would take longer. The figures run between fifty percent and sixty percent for most of the varieties of discrimination, and the overall figure has been as high as seventy percent of the apartment units in any one city. The audits are repeated quarterly, and MCFH is prepared to take legal action against persistent offenders. But its members feel that local pressure is a more satisfactory incentive for obeying the law. For this reason the city council and the local press are also informed of the results of the survey. Some city councils have reacted with suspicion and hostility; others have been spurred to initiate positive programs for their city’s housing needs. 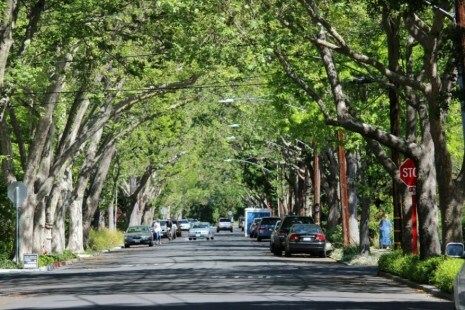 The City of Palo Alto, for instance, has set up meetings between discriminating apartment owners, representatives of MCFH, and its own Human Relations Commission; has agreed to act as co-plaintiff in discrimination cases; and has given notice, through a mailing to its utilities customers, that fair housing laws will be enforced in the city. Under discussion are ordinances that would provide for a public vacancy list; for the licensing of apartment managers; and for the use of written records of the terms offered to every prospective tenant. These stricter regulations are necessary, MCFH claims, because the education sessions they already provide for apartment managers have had little effect on their attitudes or practices. We can influence the quality of life in our own communities, says MCFH. And change, though painfully slow, is happening. A few housing developers have publicly committed themselves to equal opportunity in housing. Some local realtors now display fair housing pledges in their windows. Membership of MCFH has swelled from the original handful of people to well over 2,000, and the annual operating budget, including contributions from local industries, is over $17,000. The organization is still a long way from its ultimate goal, equal justice for all in the housing market. But it is on its way. In the bottom drawer of my old black filing cabinet sits a battered cardboard box containing the manuscript of a novel I wrote in the early 1970s. I understand now why it never found a publisher. I was way too new to this country, and way too naïve, to do justice to its thorny subject: racial discrimination in housing. As I reread some of the text, I recalled the shock I felt when I first grasped the magnitude of the social gaps. The descriptions that follow come from my own experience as I researched the book, and it began my involvement with the fair housing movement. She knew vaguely that East Palo Alto belonged to the county. … She crossed the county line now, and accelerated to get onto the overpass that spanned the freeway. As she came down the ramp on the other side, she knew she was in a different country. The road was suddenly pot-holed and bumpy, and brown dust rose in thick choking swirls from its verges. She slowed, and looked about her. Such tiny bedraggled houses, desperately in need of paint. Yards littered with junk, yet here and there a brave attempt at order and color, a flower-bed, a well-cut lawn. She came upon a few tatty shops. Surely this couldn’t be the main shopping center? 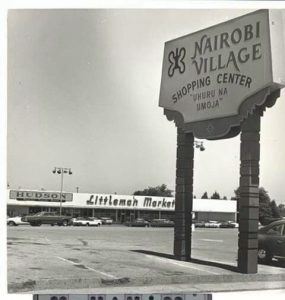 Yet soon she could see the sign, NAIROBI SHOPPING CENTER, and underneath, in a language she could not understand, UHURU NA UMOJA. She had to force herself to open the door. Lurid accounts of rapes and muggings and violence in the streets flooded her mind. Here she was the enemy. She wanted to jump back into the car and get out, away from this place. A woman passed, with two small children, headed for the market. She looked indifferently at Karen as she passed, then turned to scold one of the children, who was whining for candy. Karen let out the breath she had been involuntarily holding, and made herself move on. … Across the road, outside a liquor store, a black knot of middle-aged men stood transfixed in time, waiting for nothing. It was hot. The dust lifted lazily as she walked. Something about the huge trees, and the stillness of the air, brought to her mind descriptions she had read of towns in the southern states. But this was California. It did not make sense. A mockingbird flashed its wings across her path, still proudly singing. University Avenue, Palo Alto, circa 2014. 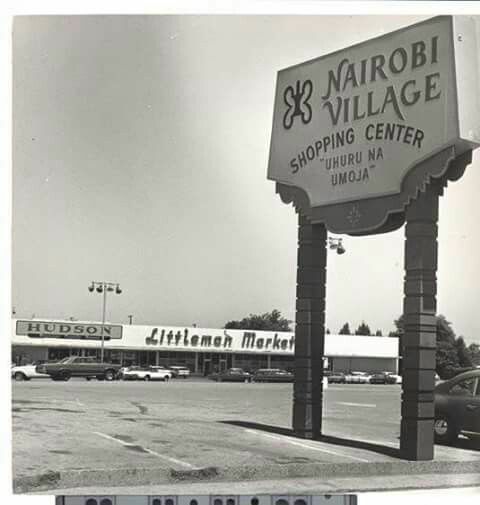 It looked much the same in 1970. Karen does her interview, in which she learns about the pressures of living in East Palo Alto (and also finds herself attracted to Paul, the advice center director). She said goodbye, and walked slowly back to the car, past the Louisiana Soul Food Kitchen and the Black and Tan Barber. The heat and dust were almost unbearable. Back across the freeway, she noticed for the first time the neatly swinging redwood sign: Welcome to Palo Alto. A few blocks further down University Avenue and it hit her like a punch in the gut. She pulled over to the side of the road and rested her head on the steering wheel, fighting back an impulse to vomit. The contrast was an obscenity. Huge magnolias here lined the street on both sides, giving deep dappled shade to the well-paved highway. Between the road and the white concrete sidewalks rose great greening mounds of juniper and ivy, and beyond them, with manicured lawns and discreet sprinkler systems, were the complacent mansions of the rich. 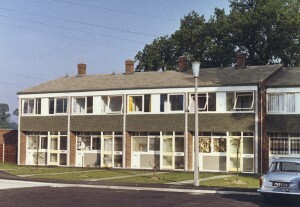 Our house, 18 Harcourt Close, Egham, Surrey is second from the left. In 1964 my husband Tony came into an inheritance, enough to put a down-payment on a small row house in a village on the outskirts of London. From first placing a ?50 holding payment on a partially-built structure to actually moving in took seven months. Today, with the purchase, remodeling and/or building of four subsequent houses behind me, I read my letters to parents from that period with wry sympathy, thinking how universal is the impatience of a young couple buying their first house. The first letter in the series has a page or more of excited detail. 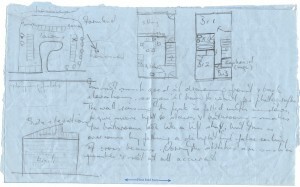 Sketch of the development at Harcourt Close, Egham, Surrey. … the building society wouldn’t consider our house for a mortgage because it was too contemporary in design – they stick doggedly to the deadly dull conventional things. We saw one the other day, part of an estate quite near here – good solid brick, appallingly bad planning, and claustrophobically tiny windows. Mortgages no bother. … One of the hazards of a speculative development – they are very reluctant to depart from the standard model, which in this case is decidedly murky – masses of dark grays, black, browns & blues. I’m getting a bit fed-up – sick of looking at samples & doing sums – I want some action round the place. … ran into trouble over the alterations we wanted to the colour scheme – we were met with a blunt ‘take-it-or-leave-it.’ However, eventually Tony rang up & told them they were a lot of bloody-minded so & so’s, & managed to get the most important concession – the colour of the tiles on the floor. The rest of the detailing we shall probably have to rip out & replace as we can afford it. Infuriating, but the housing situation being what it is, we daren’t tell them to go to hell. We went up to London on Tuesday to sign the lease & mortgage documents for the house. Exciting, but still somewhat unreal. I am ceasing to believe in the existence of the house, and find it rather unsettling to go over every other weekend or so & find they have done a tiny bit. Still no idea when we can shift in – it will probably be weeks yet. It is still hard to believe that we have actually moved in. Up to 9:15 on Friday morning, with the carrier already piling boxes into the van, we still didn’t know if we could – it all depended on the cheque from the building society being in our solicitor’s post. A strange, unreal situation to live through. However, talking to some of the other people who have moved in, they seem to have had much more trouble than us, so we must be thankful. Anyway, in all the chaos of cancellations, postponements, etc., it was too much trouble to cancel our housewarming party, so we held it as planned on Saturday night. The earliest arrivals were detailed off to put up curtain rails, shift packing cases from the middle to the sides of rooms, etc. Quite a successful party, I think. About a dozen people (& kids) stayed overnight, dossing down wherever for what was left of the night – we got to bed about 4 am, & a few more people dropped in for brunch the next morning. Needless to say by today we are both pretty worn out, but the house is more or less habitable. Strange what an effort, both physical & mental, to make a shell filled with boxes into a habitable room. 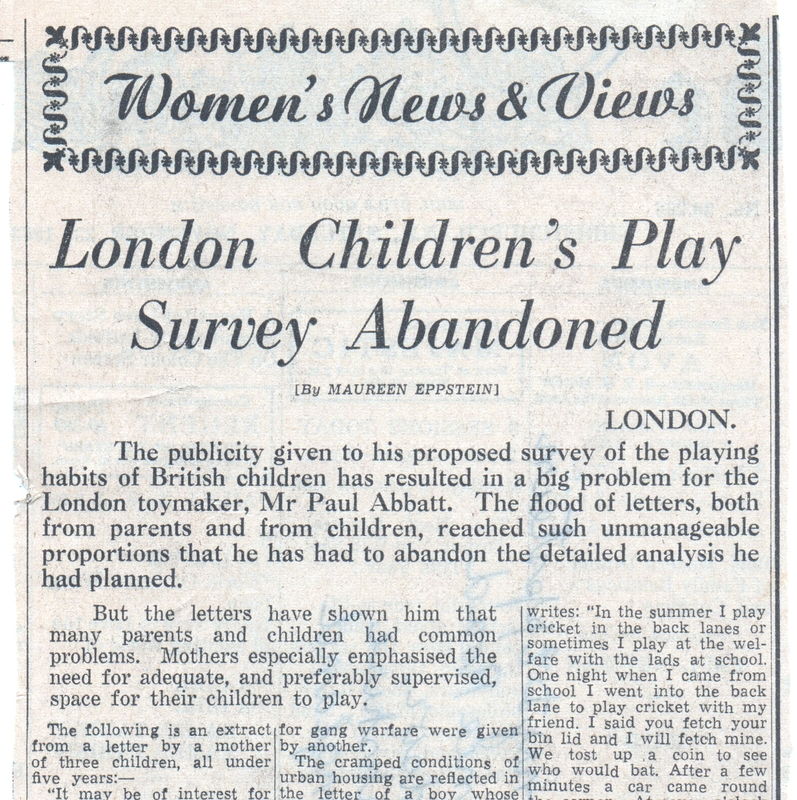 A few months after I interviewed Paul Abbatt, the London toymaker and child development theorist (see my previous blog piece, “An advocate for junk heaps”), I called to ask about his planned survey on what children actually did in their outdoor play. He sighed. The response had been so overwhelming that he’d had to abandon his plans for a detailed analysis. But he did share with me a sampling of the letters he’d received. The follow-up story I wrote for my New Zealand paper, the Christchurch Press, was published in November 1963. It is transcribed below. 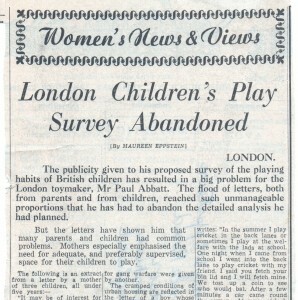 The publicity given to his proposed survey of the playing habits of British children has resulted in a big problem for the London toymaker, Mr Paul Abbatt. The flood of letters, both from parents and from children, reached such unmanageable proportions that he has had to abandon the detailed analysis he had planned. But the letters have shown him that many parents and children had common problems. Mothers especially emphasised the need for adequate, and preferably supervised, space for their children to play. Looking for the tracks of wild animals was a special memory for one boy, while the letter of another resounded with such names as Steam Engine No. 62004, Class Q.6 and Diesel Deltic, Type 5, No. D9007. Detailed rules for gang warfare were given by another. 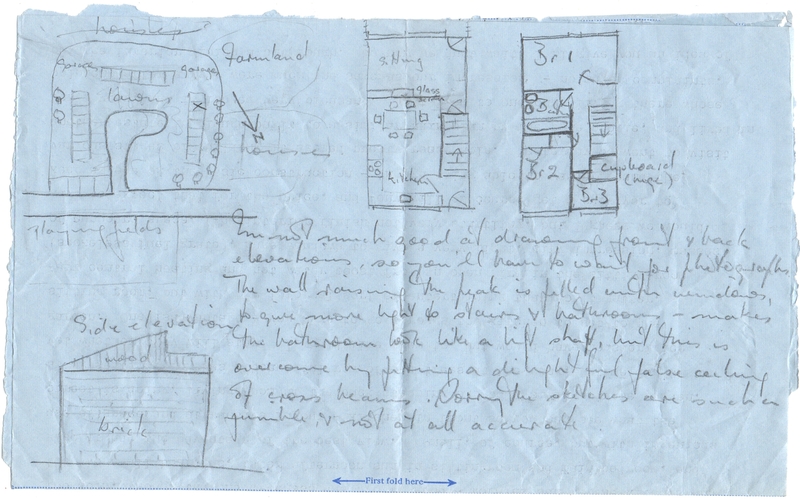 The cramped conditions of urban housing are reflected in the letter of a boy whose favourite sport is cricket. He writes: “In summer I play cricket in the back lanes or sometimes I play at the welfare with the lads at school. 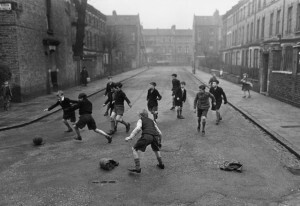 One night when I came from school I went into the back lane to play cricket with my friends. I said you fetch your bin lid and I will fetch mine. We tost up a coin to see who would bat. After a few minutes a car came round the corner. At seven o’clock my mam came to the door and told me to have a bath. I went in unhappy. “In the winter when the days are shorter and it’s dark at four o’clock I play football in the lane. Sometimes when it is raining I have a game of football in the yard. One day I kicked the ball that hard, I heard ‘smash’ one pint of milk rolling down the yard. 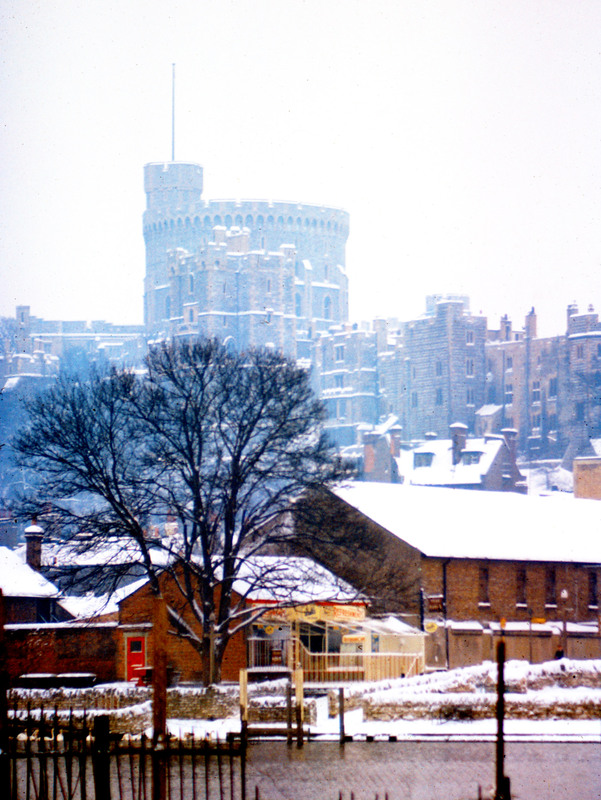 Windsor Castle in the snow, January 1963. We lived in the town below the castle. Photo by Tony Eppstein. 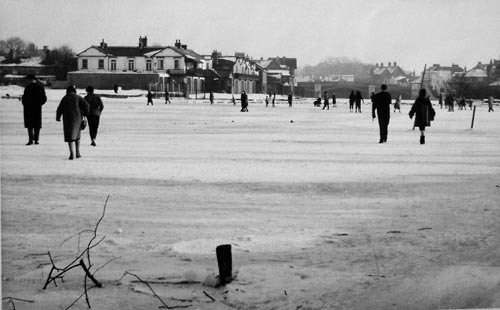 The winter of 1962-63, my first in England, was the coldest Britain had known in over 200 years. First the fog crept in. My nostrils tightened against the thick yellow damp, sour with the smoke of coal fires and diesel trains. As November wore on and the cold deepened, fog froze into hoar frost that thickened daily on the power lines until they resembled sagging ropes. 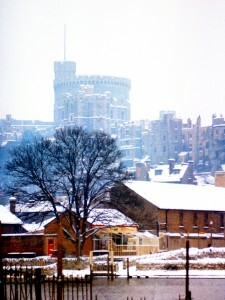 Snow began the day after Christmas. All January it snowed and froze and snowed again. Transportation systems ground to a halt. The River Thames froze over. The inside wall of our apartment kitchen, wet since November and already black-mottled with mildew, glazed over with ice. On the outsides of buildings, ice congealed around plumbing outlet pipes like candle wax dripped from lighted candles. Water pipes froze and burst. The clatter of buckets as the water truck made its rounds became a familiar sound in our Windsor neighborhood. Windsorians walk on the frozen Thames. I think we must be drifting into another ice age – the weather here continues to get colder every day. All sources of fuel – coal, gas electricity, and even paraffin, are in short supply, and everyone is fighting a losing battle against frozen pipes and general seizing up. We had our fun and games over the weekend. We were woken fairly early on Saturday morning to terrific shouting and hammering on the door. We staggered out, to find that the Hoopers were being flooded out – their kitchen was an icy pond, and water was pouring through the light fitting in the ceiling. We turned off all the taps we could find, someone somehow found a plumber, and after he, Tony and Peter [Hooper] had hacked their way through the several inches of ice outside the front gate, and even more ice on top of the valve, they managed to get the mains off. Next thing we tried to get in touch with Stan Fricker, from whose flat the water was coming – he was at work, and we had visions of him coming home to a complete flood. By the time he arrived we had swished most of the water out of the kitchen, and had got all the heaters we could find in to dry it out. So we all trooped up into Stan’s bathroom, which is directly above the Hoopers’ kitchen and, to our surprise, found very little trace of water. We bailed the solid chucks of ice out of the bath, which had been frozen up for days, and Stan and Tony got to work on the floorboards, which were suspiciously damp. They managed to raise a couple, and discovered that the break in the pipe was right underneath the bath, which had been very recently closed in and modernised with plywood, fresh paint, and what not. A brute to get at. The next thing to do was to find a plumber to fix it – easier said than done – “Oh no, love, we couldn’t possibly let you have one till Monday.” I don’t know how many pennies we spent on phone calls over the weekend, but at fourpence a call we went through several shillings. But we still couldn’t get a plumber till Monday, and late Monday afternoon at that. So we borrowed buckets of water from a neighbor, and puddled along with little dribs of washing where necessary, keeping most of it for drinking. It was pretty messy. At least in the old days they had facilities in keeping with such conditions – but try using a modern-type lav when you have nothing but half a bucket of dirty water to flush it with. That was the first thing that Margaret [Hooper] did, with great ceremony, when the plumber finally managed to get the water on again for us on Monday evening. Our lav had to wait a few hours longer – the remaining water in it had got so iced up that it had to be very carefully thawed before anything would move. And we still can’t have a bath – the outlet pipes in the bathroom are frozen up and, according to the plumber, that will just have to wait till the thaw. The kitchen outlet, which comes down in the same place – down the outside wall on the coldest side of the house, now shows signs of doing the same thing, which would be choice. I am shortly going to do some washing, and hope that the gallons of hot water from the tub will deter it. Still, we could always throw our slops out the window – if we could unfreeze the windows enough to open them, that is. Might as well be really primitive. We are getting rather advanced ideas on the proper requirements of a house in this climate – they do not agree very much with the conventional buildings most people live in here. Definitely central heating, double glazing, and interior plumbing.